This is a list of the tallest players currently playing professional soccer around the world. Belgian Goalkeeper who plays for the Belgium Jupiler League club, Standard Liege. 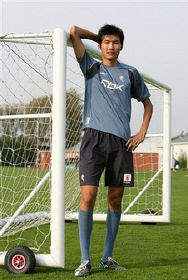 Chinese striker (pictured above) who currently plays for the club Three Gorges Kangtian in China. He had a one month trial with Bolton Wanderers in 2006. Norwegian Striker who plays with Aalesund FK in the Norwegian Tippeligaen. The Norwegian striker plays in the second tier in Norway with Sarpsborg Sparta FK. He is also a former Norway U21 player and has been linked to Norwich City. The Norwegian keeper currently plays for Stryn Fotball in the Norwegian 3rd division after recently playing for FC Lyn Oslo in the Tippeligaen. The 26 year old Norwegian Defender is, as far as I can tell, currently without a club, after leaving Arctic Circle based Bodø/Glimt in the Norwegian Tippeligaen in June 2009. The Czech Striker is currently playing in the French 3rd division with AS Cannes after recent years with Krylya Sovetov Samara, 1. FC Nuremberg, AS Monaco and Borussia Dortmund. Serbian striker who is currently playing for Valencia in Spain. Many clubs have reportedly gone after the big man, including Tottenham Hotspur, Fenerbahçe, Man City, Werder Bremen, Barcelona and Juventus. Italian Goalkeeper currently playing with Grosseto in Serie B after a short spell with Livorno in Serie A.
Australian Goalkeeper who was up until last season, with AC Milan in Serie A. He now plays for recently promoted Kavala in the Greek Super League. Kalac made three appearances in 1996 for Leicester City in England while playing for current Aston Villa manager Martin O'Neill. Maierhofer is a striker currently with Wolverhampton Wanderers in the EPL after a successful time at Rapid Wien in the Austrian Bundesliga. In 2007, Stefan was with Bayern Munich but he only managed two sub appearances before moving on. The 21 year old Serbian goalkeeper transferred to CD Nacional in Portugal in 2008. Random Fact: The Tottenham striker and his family moved to Singapore when he was 4 and lived there for a year. Early in his career he played for IFK Hässleholm in Sweden. After many years in England at Wrexham, Swansea City, and Crewe Alexandra, Dennis has moved back to his native Trinidad to play for San Juan Jabloteh. English born Defender who recently transferred to Championship side, Scunthorpe United, after most recently playing for Hibernian in the Scottish Premier League. Sako is with 2.Bundesliga club FC St. Pauli in Germany after short stints in the lower divisions of England at Torquay United and Rochdale. Dutch Goalkeeper currently with AGOVV Apeldoorn in the Dutch Second Division. He had previous stints with Aston Villa and Wolves in England. The 28 year old Englishman made over 100 appearances for Lincoln City before moving around to various lower league clubs. He is current playing with League Two club Bury FC. The French-born keeper has played in the lower leagues in England for many years. He signed with Scottish club Aberdeen in 2008 and has signed with Crewe Alexandra for this season. Ndlela is a South African International (9 caps) who plays in the South African Premier Soccer League with Moroka Swallows. Krzywicki recently move to Flota Świnoujście in Polish second division. The big defender plays with Polonia Bytom in Poland's Orange Ekstraklasa. The 30 year old Central Defender plays with Czech Gambrinus Liga club FK Mlada Boleslav. Antal, a young Hungarian goalkeeper, has recently made the leap to the Watford first team after spending a couple of years in The Hornets academy. It was tough to find a good source for this list so, once again, feel free to let me know if there are any current professional players that should be included (2.00m or taller). pls take a look at this.. he is 2.05 m.
Thanks for the information. I've added Vanja Ivesa to the main list. hello , you forgot the tallest of them all , kristof van hout at 2,08cm! I hadn't heard of that player until your comment. Your help is very much appreciated! HI, found some new tall players. Just sharing my knowledge with your great site. Wow, Nkanu, You're on a roll! I'll get around to checking into and updating all your additions in the next couple of days. Again, You're research/knowledge/help is much appreciated. If the list gets much longer I may decide to up the minimum to 2.02m. do you need more help??? why doesen't you add my new players??? I had planned to update the post but forgot about. (I've been really busy recently). I don't know when I'll get to it, but I will try in the next week or so. I don't think there are any more players over 200cm, at least i don't know any more, and i have worked a lot on this subject! please update the site again Steve. I've been really busy recently. I'll try to update this weekend. here is a link to see how kristof van hout does !!! please update your site agian or give me the possibility to work on it. I've checked at a number of different sites and they all list Matthew Booth at 198cm or 199cm. Congratulations for the topic, i loved it! I hope i'm helping! Washington da Silva is actually 2. O3m in Height. Costel Pantilimon goalkeeper at FC Timisoara has his height given as 6'8, or 2.03metres on his wikipedia page. Thanks Erik Schmidt and littletimi9, I haven't had time to update this post recently, but I'll get to it in the next week or so. Thanks for the input. This is an invitation to a football training camp on the beach and friendly matches in excellent stadiums in Cadiz, Spain. Look here for more information. http://orvaz.com/beachsoccer/. Start thinking about sand, sunshine and SOCCER! Thanks for the great site keep it up! I added Antal and Kaczmarek, but couldn't find any concrete info for Cabrera. Any links you could provide for Cabrera would be appreciated. Found this profile of him and a picture! What about Costel Pantilimon - 2.03m from romanian side FC Timisoara. A holiday and football training camp on the beach and friendly matches in excellent stadiums in Cadiz, Spain. Look here for more information. http://orvaz.com/beachsoccer/. Start thinking about sand, sunshine and SOCCER! There is Olympiacos's former goalkeeper, Juraj Buček, he is 2.04m. Vitali shuhanua.Belarusain striker is 6 ft8 1/2inches, club jk nomme. tonny brogaard gk 2.06m (6 ft 9). bogdan milic striker.2.01m (6ft 7) montenegro.club ADO Den hagg. Thanks for all the help guys. I haven't had time to update recently but I'll try and get to it in the next week or two. All the comments are appreciated. i want to be that tall some day! i am 5 9" and i am 12. who knows!? that would be awesome! the guy at the top is going down!!! watch out dude! here i come! most def one of the best tall players. pantilimon for manchester city is beats also akinfenwa is beast! Costel Pantilimon of Politehnica Timişoara on loan at Manchester City is 6'8". kristof van hout, I think he is the tallest player of all time. who is can ozcan ? Emm.. The goal in the picture is not of official size. It's a small goal used in e.g. 5-a-side games. Official goal is 8 feet high. Someone probably pointed this out before me. i'm about 6ft1" and 17yrs old. Also i want to become a pro footballer and i weigh about 73kg. What position do you think is best for me apart from goalkeeping. Paul Millar plays in the third or fourth league in Scottland. He's a 2.08 cm tall striker. The tallest footballer alongside Van Hout. According to Wikipedia Zeljko Kalac is - 2.10m - (6ft11) which would make him the tallest if he were still playing. How about the 'top fattest soccer players in the world' list? Nikola Zigic is the man!! He is very talented too! Also Michał Wróbel - Polish goalkeeper, who stands at 201 cm (6 ft 7 in).